A smashing new entry in the Mario Tennis series. I grew up a staunch Mario Tennis fan, spending quite a bit of time playing through cutthroat matches with my father on the Nintendo 64's Mario Tennis. I consider it to be the pinnacle of the series, and I believe developer Camelot created one of the best arcade-oriented sports games ever with both Mario Tennis and Mario Golf. That's why I was thrilled to see Camelot returning once more to craft the newest, action-packed entry in the series, Mario Tennis Aces. The eighth installment in the long line of Mario Tennis games is the first since Mario Tennis: Power Tour back on the Game Boy Advance to feature a Story Mode (now called Adventure Mode), as well as a litany of playable characters, courts, rackets, and even bosses to conquer on your way through the game. From the very beginning of the game, it's clear that Camelot treated this Mario Tennis title as a veritable return to form. It's easy to see that all the boxes were ticked this time around: local and online multiplayer, Adventure Mode, and various other ways to enjoy rousing games of tennis. No matter what kind of player you are, there's something to enjoy here. 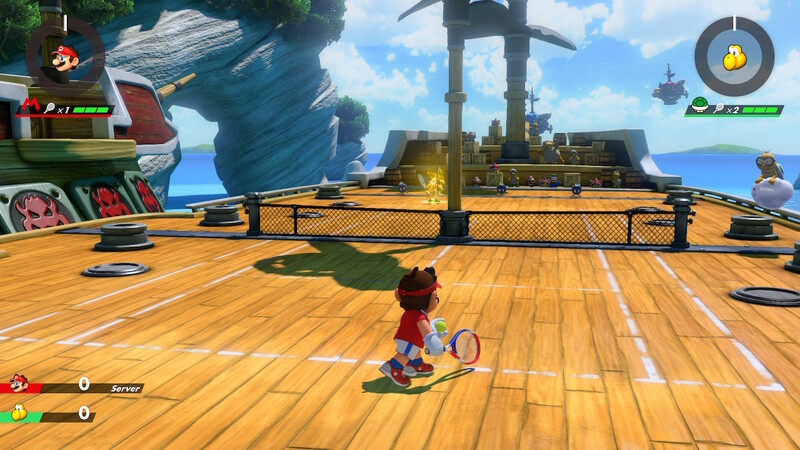 For the most part, the game plays like other classic Mario Tennis titles, with a few new mechanics sprinkled in for good measure. Aces features new mechanics like Zone Shots and Zone Speed, which quickly become integral to winning various challenges. If you think you'd like to try the game without relying on these types of flashy moves, forget that straight away, because your opponents are going to lean on them heavily, so you better believe you should use them as well. Zone Speed slows down time for you to line up and smash powerful Zone Shots past your opponent for you to breeze on by them in the rankings. On the flip side, if you try and return a Zone Shot at the wrong time, you could be hit or break your racket. Run out of rackets, and you lose. It becomes a dance, in some situations, figuring out whether you should even bother to try and return a Zone Shot, sacrifice a racket, or attempt to block it, which adds a layer of deep challenge to the game. Then you have Trick Shots, which each character has a special version of. They let you reach balls that would normally be out of your reach to keep you in the game longer, and they also look quite flashy and satisfying. It also helps to charge your energy meter so you can pull off the Zone Speed and Zone Shots, which I will reiterate are absolutely integral to your success. 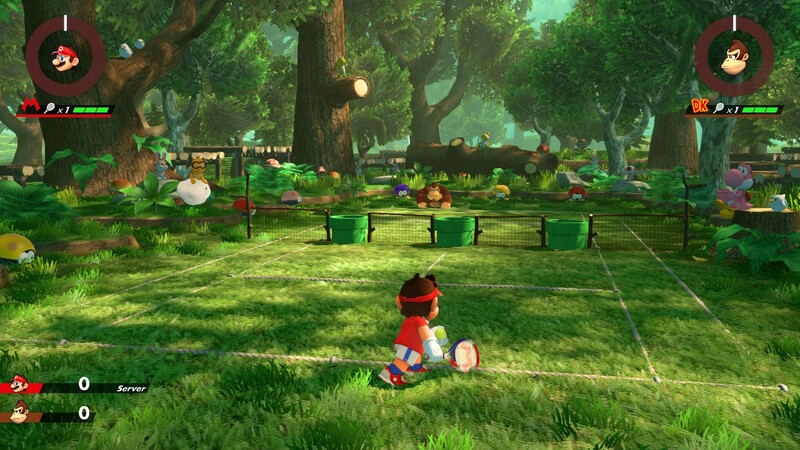 With all these new mechanics, however, Aces still feels like an excellent, traditional tennis game at its heart. As the ball whizzes back and forth, you feel like a true tennis master, even when you're down 0-40, and you know you're about to fail. There's an adrenaline rush every time your opponent hits the ball back to you, and every single volley just feels so good you have to keep going in for more. This feeling remains in every nook and cranny of Mario Tennis Aces, and the new mechanics drive it home even further. It's really quite something, especially when you master the new moves and can implement them without even having to think about it. Of course, you need players to pull off these moves for you too, and Aces delivers them in droves. With characters ranging from Mario to Daisy, Waluigi to Spike and even Chain Chomp, there's a player to fit your needs in various different classes, like All Around, Speedy, Powerful, and Technical. Honestly, it's just entertaining to watch a Chain Chomp gallivant around the court with a tennis racket in its mouth over anything else, though. There are more characters being added to the game in the coming months, so we'll have to keep an eye out for those as well. Mario Tennis Aces' Adventure Mode is the crowning jewel of the entire package. Playing through a vanilla game of tennis is fun, sure, but you've never truly lived until you've gone toe-to-toe with some of the harder bosses. As far as why you're here in the first place, your journey follows Mario on a journey to collect five power stones across the entirety of an island rife with familiar characters plucked from Mario games, as well as some new faces. 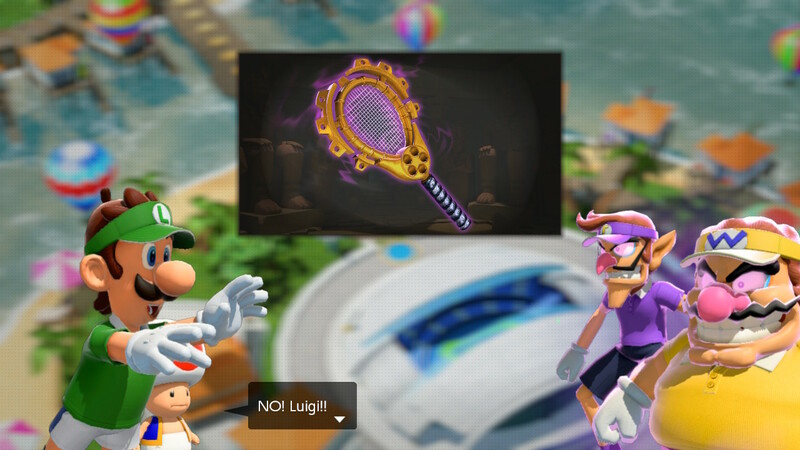 Shy Guys, Koopa Troopas, Boos, and more are seen throughout your adventure, as you work to track down your poor brother Luigi, who's somehow found himself possessed by an evil tennis racket. So have ne'er-do-wells Wario and Waluigi, and they're traipsing around getting up to no good as well. It falls on Mario to rescue them all, while working to save the island from incurring any more of the evil tennis racket's wrath. Who knows what horrors could befall it otherwise? So the story isn't worth writing home about, but that's not why you're here in the first place. Adventure Mode is, by far, the best part of Mario Tennis Aces, for a number of reasons. Though traveling throughout the island from stage to stage doesn't do anything new or engaging for the series, it does introduce a number of challenging stages that will push your abilities to the limit. If you think you're a good tennis player, or a Mario Tennis expert, you're going to be humbled quickly. This game is out to get you, and it doesn't care who knows it. 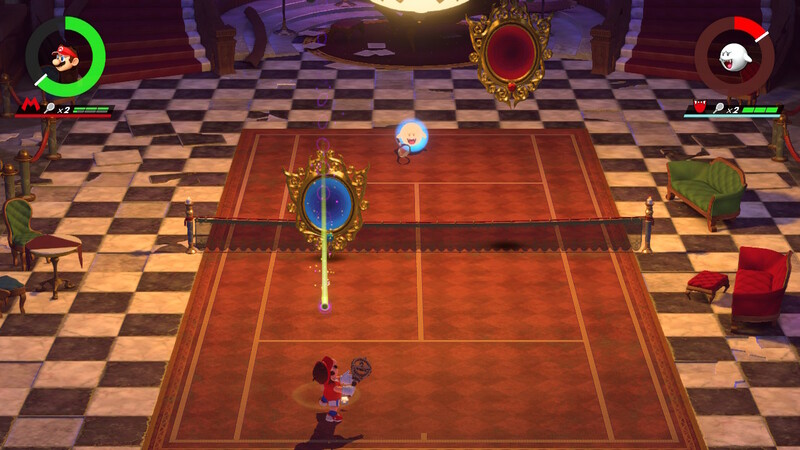 As you travel around and hit the courts with various themes, such as forests, spooky old mansions, snowy mountains, and even the high seas, you'll face off against enemies with different abilities and tennis skill that'll put yours to shame. It's not just vanilla tennis you'll be playing, either. Sure, sometimes that's all you have to worry about, but other times you'll have to send balls hurtling toward piranha plants to knock a certain number out. 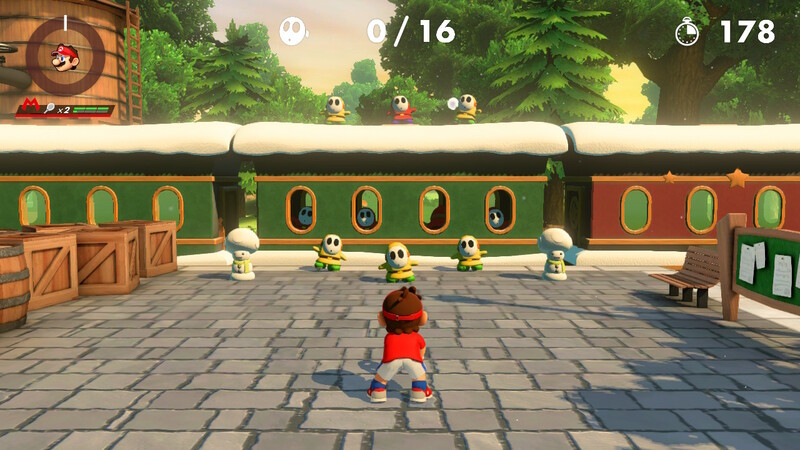 You might have to knock Shy Guys off of trains to clear a level. Maybe you'll be asked to clear a stage by racking up 300 points in a rally contest against a wayward Boo. These are extremely fun riffs on the classic tennis matches you can get into in Tournament Mode or regular quickplay sessions, but some of the challenges get downright ugly very quickly. You'll be cruising around, gaining experience as you complete stages, and then you'll run into a ridiculously hard opponent that seemingly has superhuman timing and speed. In particular, I was felled over and over again by a Shy Guy who I was matched up against while crowds of characters crossed the court from a train. Not only did I have to worry about the Shy Guy's return rallies, but I also had to deal with the other Shy Guys crossing and the other folks, like Koopa Troopas, who the ball bounced off of. Those stages acted as several pain points for me, and they'll require you to keep trying over and over if you want to make any progress. As such, it can sometimes be difficult to make it through Adventure Mode without a decent amount of practice if you're not well-versed in the game's special Trick Shots or Zone Shots. When you best your opponents, you'll be rewarded with experience, and sometimes different types of rackets as well, which is awesome, since you need multiple rackets to ensure you can stay alive and afloat in certain matches. Things can be extremely frustrating without them, expecially during boss battles. 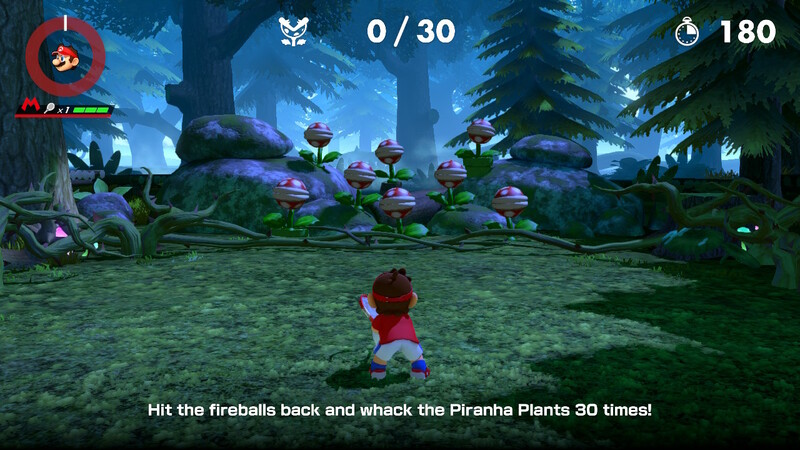 There are a wide variety of boss challenges, ranging from those that force you to solve puzzles before getting to them and simpler showdowns with patterns that are easy to figure out and exploit, like the earlier Petey Piranha fight. Adventure Mode offers a taste for all players, whether you're looking for something a little more daring than the regular tennis matches, or you want to test your skills against AI that seems nigh impossible to best at times. Most importantly, it's absolutely exhilarating when you beat particularly difficult opponents, a feeling Mario Tennis games have always been able to produce for me. I'm glad it's here in full force. Mario Tennis Aces has provided me with some of the most fun I've had in a Mario game in quite some time. Through it all, even the most frustrating parts of it, I was compelled to keep playing, no matter what. It's addictive, just like the other iterations that came before it, in the best way. Unfortunately, at this time I've been unable to access the game's online features, since I've been playing the game offline ahead of its official release. As a result, these features were not added into my score, and I'll be addressing them once I've had time to play a few online matches. As far as multiplayer goes, however, local matches were a breeze. Playing with friends – especially with the game's Swing Mode that allows for motion control play like that of what we had with Mario Tennis and Wii Sports iterations – is a blast. It's absolutely fantastic, and part of what makes these games such an exciting treat when we do get them. Should you pick up Mario Tennis Aces? If the answer wasn't immediately obvious already, that's a resounding yes. It's the best the series has seen in years, and that's saying something for this tennis fan. If you're looking for one of the best sports games the Switch has to offer, look no further. You've found it. This review is based on a Nintendo Switch digital release. The key was provided by the publisher. Mario Tennis Aces is coming to Nintendo Switch on June 22, 2018. The game is rated E10+. Adventure Mode is challenging and rewarding. Tons of ways to enjoy tennis matches. Unlockable rackets make for awesome side quests. Swing Mode gives players Wii nostalgia. Some AI matches have uneven difficulty. Unf. Little bummed about the lacking single player mode, but honestly this will be played almost exclusively with others or online. So excited for Friday! This review made it sound as though the single player mode was one of the best parts, or am I missing something? I just heard it was short, at like 2-4hrs total playtime depending on how difficult you found it. Also some people wanted deeper RPG elements compared to past games. Ah I see, yeah that is unfortunate then. I too was hoping for more single player content. Online mode isn't even enabled yet for any reviews. The tournament mode and day 1 patch to fix lag will be released on the actual release date. Also the online mode is the main reason i'm getting this game. The demo was just so damn fun... if they fix the lag (I never had too many problems as long as I only matched up w/ people with green bars) then this game is going to be a 9 for sure.